Here’s a story that’s only in the Arabic-language papers. The U.S. 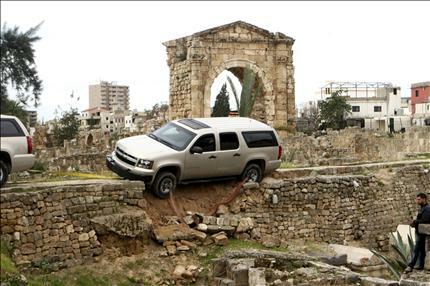 Ambassador to Lebanon, Maura Connelly, visited an ancient historical site near Tyre, and one of the SUVs in her motorcade crushed a small portion of ancient wall. (Or just some wall–the papers I’ve seen so far are not entirely clear). In any case, you can see from the photo that the path is not intended for vehicles.